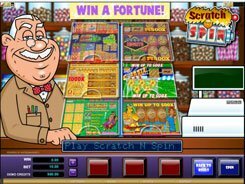 This is a completely unique slot game with 5 reels, 4 rows and 40 fixed paylines that transform into a 1024 ways to win system during free spins. 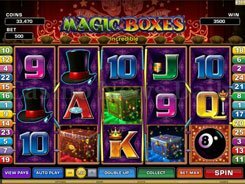 The slot is themed around Halloween, so the symbols include four kinds of spooky ghosts, Halloween treats and a little Gavin the Ghost Zapper. 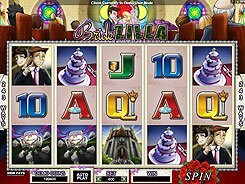 A total bet per spin ranges from $0.4 to $100. The slot has a Ghost Meter to the right of the reels. Once Gavin lands on reel 3 in a normal game, he zaps a ghost with his ray gun. 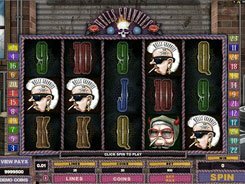 Zapping a ghost fills in one segment on the Ghost Meter, and when you collect 10 ghosts, you activate a free spins feature. 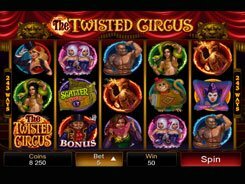 During the free spins you can benefit from Stacked Wilds that appear on reels 4 and 5 increasing you winning chances. 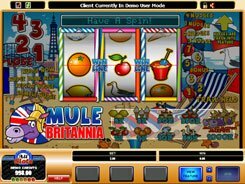 Besides, hitting a three-symbol combination during the free spins will get reels 4 and 5 respun while the first three reels will stay in place, which means a chance for some bigger wins. 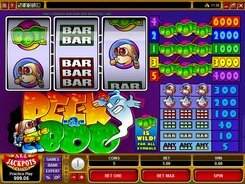 The highest prize of $5250 is awarded for landing five Peek-a-Boo logos across an active payline, but during the round of free spins you can pocket a way more. PLAY FOR REAL MONEY!